Periodontal disease is an oral disease that, over time, destroys bone and gum tissue. It is often called gum disease because it primarily affects gum tissue in its early stages. However, if a patient fails to stop the progression then it can lead to tooth loss, bone loss, and other health issues. Interestingly, nearly half of all Americans over the age of 30 suffer from moderate to severe periodontal disease according to the Centers for Disease Control and Prevention (CDC). The risks of developing it jump to 70- percent by the time you reach retirement. Most Americans do not realize that they have it because it is often painless and insidious. Gingivitis – Periodontal disease begins with gingivitis, a milder form of periodontitis that causes inflammation and infection of gum tissue. This can cause gum tissue to turn red and the gums may also bleed when brushing. Gingivitis occurs when dental patients fail to properly brush, floss, and kill the germs responsible for producing plaque. Plaque is a sticky yellowish-gray biofilm of bacteria that clings to tooth surfaces. Not only does this sticky film of bacteria form acids that eat away at the enamel of teeth, but it can also absorb the minerals from saliva and harden into tartar buildup along the gum line if it is not removed within 24-hours. Periodontitis – Once tartar cements itself onto the tooth surfaces, brushing and flossing alone will not loosen it. 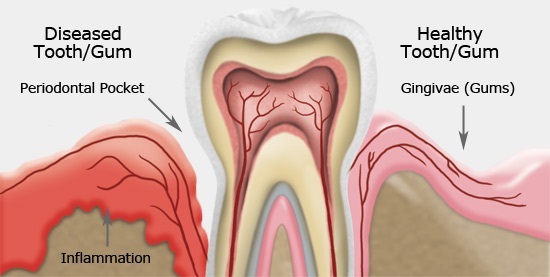 And as the tartar builds up, periodontal pockets will form between the bones, gums, and your teeth. At this point, a professional deep cleaning is necessary to carefully remove the pockets of tartar that accumulated below the gum line. If neglected for a long period of time, then these pockets may fill with pus and develop into painful dental abscesses. In any regard, as the plaque buildup progresses, the fibers of bone and teeth are weakened and gradually destroyed. Halitosis may also set in with the teeth also becoming more sensitive. Finally, the gum line and bone may recede and thereby cause the teeth to loosen. Properly brushing and flossing your teeth and using mouthwash to kill germs are the most effective forms of preventative maintenance. Quitting smoking and living a healthy lifestyle is also important. However, scheduling a professional cleaning and check-up at least every 6-months to monitor your mouth is the secret to optimal oral health. Our English-speaking specialist periodontist will check for periodontitis by probing and measuring the depth of any periodontal pockets. It is important to maintain the habit of flossing every day to reduce the buildup of irritating plaque below the gum line. It doesn’t matter when you floss, so long as you do it once a day to flush out any plaque before the 24-hour window (the time it takes for plaque to turn into tartar). When you floss your teeth, you polish the tooth surface on the sides, in between each tooth, and below the gum line. Tartar is most likely to develop in areas that are difficult to brush, where lower teeth are clustered together, crooked, or damaged. Our dentist may use lasers, ultrasonic scaling tools, and hand tools to remove the tartar buildup. Your whole mouth will feel fresh, clean, and healthy after a professional deep cleaning. If you fail to prevent periodontitis, you may develop loose teeth that could require removal. The final treatments are bone and gum grafts to regenerate lost tissue, plus appliances like dental implants or dentures to replace teeth after removal. If dental care in Peru is something you may be interested in, please contact us to ask any questions you may have, or set up a consultation appointment with our specialist.